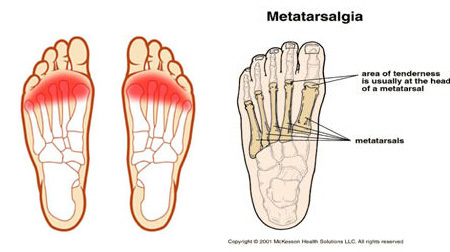 Metatarsalgia is an umbrella term used to describe pain felt at the fore foot and includes a range of symptoms. 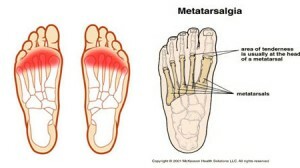 Metatarsalgia usually occurs at the ball of the foot. It is quite common and can present to be quite painful. Usually pain is present at the area of the metatarsals on the foot, as can be observed in the diagram below. Pain may generally be noticed to increase when walking barefoot on hard surfaces. You may start to notice an alteration in your gait, so as to avoid applying pressure to the area of discomfort. All of these factors ultimately lead to an alteration of the biomechanics of the foot, thus causing an increase in pressure at a particular area of the forefoot, leading to pain and discomfort. Treatment methods range from using the RICE therapy, which involves resting, icing, compressing and elevation to the use of padding and orthoses. The aim of all the treatment methods would be to offload the area and to aid with redistributing the pressure to other areas of the foot.